At Sugarbliss Cake Company we believe your cake is the centre-piece of your wedding reception and you want it to taste as stunning as it looks! Our deliciously moist cakes are freshly baked using the finest ingredients in our cakery and we pride ourselves that our cakes not only look fabulous, but taste sensational too. For just £12, we will send you a Sugarbliss Taster Box so you can experience four cupcakes of our most popular flavours or for £4 a single Taster box. 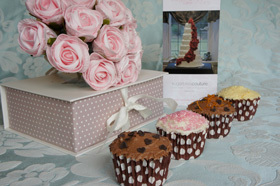 This service gives you the opportunity to taste our delightful cakes before you choose the design of your dreams. If you go on to order a Wedding Cake from Sugarbliss Cake Company, the cost of one Taster Box will be deducted from your order for cake orders over £100. To order a Sugarbliss taster box please contact us on 01564 774 223 or complete the contact form here. We can also can post your taster box if you are unable to collect.